UPDATED FOR SPRING BREAK 2019!!! Time for a little fun in the sun, and a lovely SunSpray tan before you slip into your swimsuit, grab your towel and head for that lounge chair. Pure relaxation! Before all that relaxing can happen you need to do one more thing….put on your SUNSCREEN! Heading out on your Spring Break Vacation? First go BOOK YOUR VACATION!!! If you haven’t tried Airbnb yet this is who I use to book my get aways. There are really great places to rent all over the world and the the renter and homeowner are both checked so you can feel comfortable safely renting through the service. 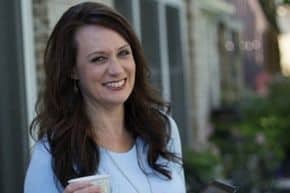 If you are new to Airbnb great! I was able to get you $40 toward your first trip for signing up. Just click through the link and follow the easy steps to be on your way. What Is The Best SunScreen After My Spray Tan? Sounds pretty easy, until you get to the store and stand in the isle with all 10 million sunscreen bottles and your eyes glaze over and you can’t remember what I said or how you can possibly choose just one tube in the sea of SPF containers. So I decided to pull together a few of my favorite sunscreens to use after your spray tan. Writing this blog post for y’all I learned quite a few things about sunblock! The first thing I learned is that they don’t want you to call it sunblock because it doesn’t completely block the sun’s harmful rays. It filters the harmful rays; therefore, it is called sunscreen. There are two different types of sunscreen; physical barrier (think zinc oxide) and chemical based. They either reflect the sun’s harmful rays away from our skin or they absorb the rays and break them down releasing them as heat so they are not absorbed into our skin. Some sunscreens are a combination type product. Sunscreen comes in lotions, creams, sticks, sprays, and powders. It can be all natural and organic. Oil based or oil free. For everyday use or for extended outdoor activities. There is also some controversy on several of the commonly used SPF ingredients contained in many sunscreens. I tried to steer clear of the products that contain those ingredients and choose the safest products that I could find on the market. ……And on top of all that, then we have to make sure the sunscreen that you choose is safe for your spray tan so it doesn’t ruin and remove your fresh vacation tan. The Skin Cancer Foundation and the Environmental Working Group both have lists of approved sunscreens that I worked off of to choose the products that offered the best SPF protection, top rated ingredients and were the safest for you and your spray tan. Some of these are all natural and some of them are not. Just so everyone has options that appeal to their personal choice. 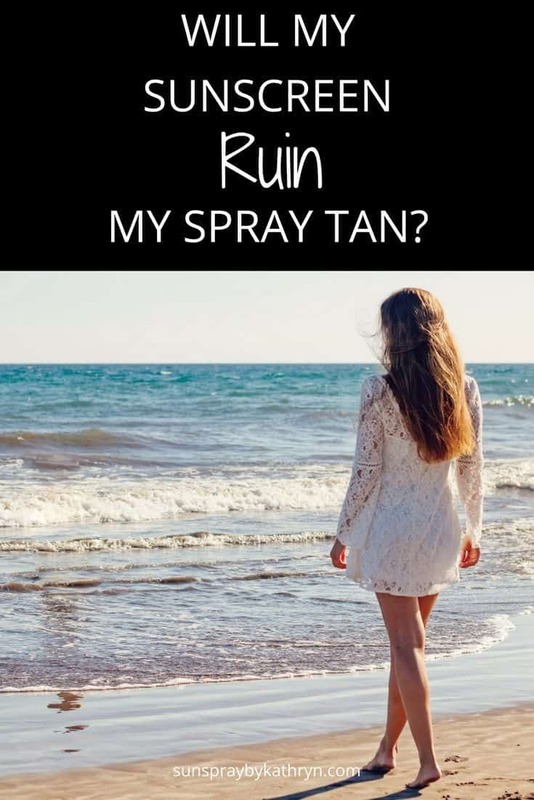 I also automatically removed the spray sunscreen products from consideration as I feel that that the propellant and alcohol in them react with sunless tans creating a patchy fade, and NOBODY wants that business happening. 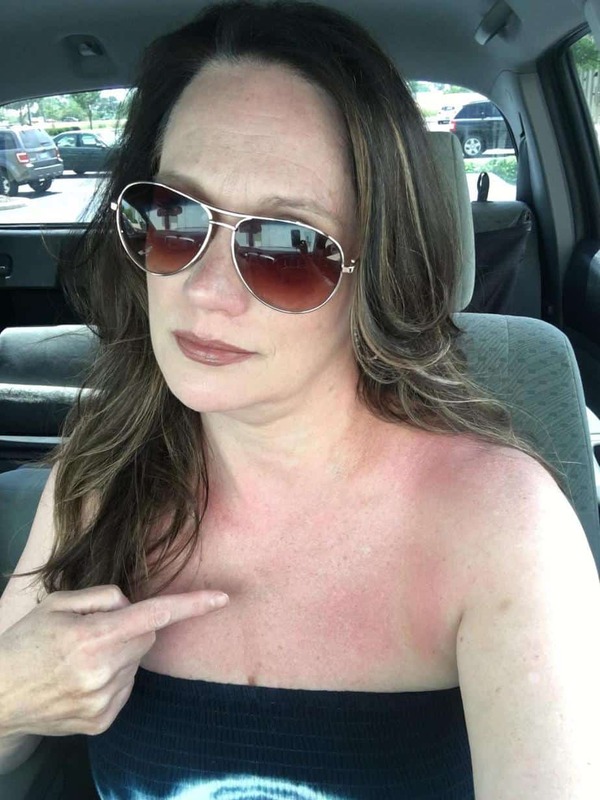 And if you follow me on FB you would have seen that last summer after using a spray sunscreen on my arms, chest and back that I fried myself. I say NOT EFFECTIVE PROTECTION. Use one of the approved lotions please. Does Spray Tan Have Sunscreen or Block The UV Rays? I LOVE the Alba Botanica line of products having used several of their sunscreens for myself and my boys. They are made with top quality natural sunscreen ingredients, rated a 2 for ingredient safety by the EWG website and are well reviewed on Amazon. This company has been doing it right for a long time! They are also missing all of the ingredients that I caution to stay away from when wearing your spray tan. I LOVE the Coola brand of products! Coola is rated a 1 by EWG for top quality safe SPF ingredients, they have different sunscreen products and rave reviews. Amazon Best Seller also. Give your skin an immediate line-smoothing matte finish and fight signs of aging caused by the sun with this antioxidant-infused farm to face sourced broad spectrum spf 30 mineral sunscreen. This unscented and lightly tinted formula is made with natural rose hip oil which is rich in free radical fighting vitamin c. Naturally calming evening primrose and flax seed oils deliver abundant omega-3 and gamma-linoleic acid to improve elasticity and help skin retain moisture. Natural shea butter smoothes and hydrates while the phyto-protector plankton extract rejuvenates skin. Formulated for all skin types and tones, including those that are especially sensitive or oily. Features: Good for all skin types including Acne and Rosacea, Sensitive skin friendly, won’t clog pores. Elta MD is a great physical barrier sunscreen lotion. Lightly tinted to keep away the white sunscreen mask this is perfect for under your makeup. It is gentle and suitable for sensitive skin, dries nicely and can be used on both face and body. 4.5 out of 5 stars on Amazon and rated a 2 for ingredient safety on EWG’s website. This sunscreen looks good on your skin and won’t ruin your spray tan. The Babyganics sunscreen is formulated without: PABA, phthalates, parabens, fragrances or nano-particles. All those things we DON’T want on our pretty spray tans or on our babies. I use this on when we go out on our boat. It gives me great protection blocking the rays off the water. This product has been rated by the EWG website and has been dermatologist tested and approved. The ingredients are safe won’t, remove your spray tan, and top rated on Amazon. Sun Bum is a small company in Cocoa Beach, Florida who manufactures a great sunscreen and a highly rated baby line called Baby Bum. So cute! EWG has rated Sun Bum a 2 on its ingredient safety listing, it is recommended by the Skin Cancer Foundation and is a best seller on Amazon. People really seem to love this all natural sunscreen! Sometimes it’s just easier to wear the same thing that you are putting on the kiddos. There is a lotion and a convenient stick for quick swipes on the shoulders or little noses. Sunless Tan safe. And because y’all know I LOVE my doggies I wanted to include a sunscreen option for our fur babies, when they are spending beach time or outside time with us because they can get a sunburn too. This doggie sunscreen is a MOISTURIZER, SUN PROTECTANT, and BUG REPELLANT. All good things! It’s an all natural vegan organic balm to heal dry, rough, chapped, cracked noses and helps protect against the damaging UV rays of the sun. And NO ZINC because that is toxic to dogs and we love our fur babies! So here you have my top 5 sunscreens that include safe/effective ingredients and are safe for your sunless tan. Finding sunscreens that fit into my criteria was actually NOT as easy as I thought it was gonna be. Grab your favorite sunscreen and get ready for a great spring break 2019 and an amazing summer!! !